It’s human nature not to want to discuss things which frighten us or make us uncomfortable. However, there is a big difference between getting hung up on morbid thoughts and simply having a plan of action for realistic potential crises. Extreme weather can present itself almost anywhere you go. Hurricanes are powerful and incredibly destructive. Wildfires have engulfed neighborhoods once thought to be safe from harm. Tornadoes rip through and destroy entire communities. You never want to think about these things happening, but they are a possibility. Do the responsible thing for your family. Create an emergency plan checklist and fill out this family emergency plan template so that you and any first responders can have immediate access to potentially vital, life-saving information. It won’t take long, and it will give you and your family peace of mind. 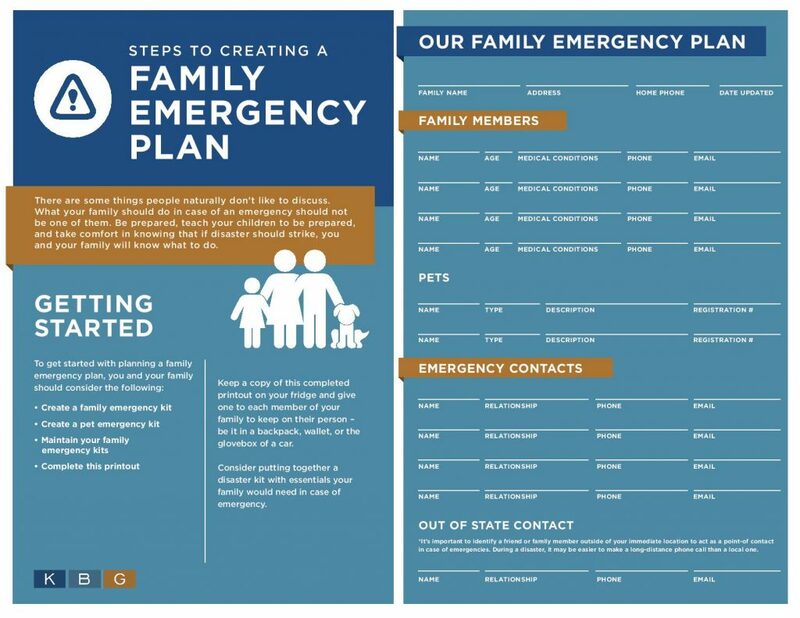 Click here to download the Family Emergency Plan Worksheet! To begin your emergency preparedness plan, you will need to think about potential dangers in your area. Are you in a flood zone, the path of hurricane season or an area that has frequent wildfires? You never know what will happen, but preparing for the more likely dangers will keep you one step ahead. Create a family emergency kit. It should be a portable plastic case, preferably with a handle. There should be first aid items inside of it. Include things like bandages, antibiotic ointment, scissors, tweezers and hand sanitizer. You will need food, too. Keep a small supply of canned goods. It’s best to make sure they are high-density foods that will keep you feeling full for longer after you eat them. Include bottled water, flashlights and an extra store of any needed medication. It’s also a good idea to include copies of your utility bills for identification purposes. Don’t forget your pets — add some canned dog or cat food if you have a furry friend. Pack essentials only. You need to be able to leave with your kit in a hurry. Depending on the emergency, you may have time to add more when the moment presents itself. Another idea is to pack a second tier kit with extra items. Write down where your emergency kits are located. You don’t want to have to think about it in a panicked situation. Have a family meeting, and discuss what you would do in any given emergency. Identify safe spots in your home for tornadoes or hurricanes — usually in a basement, or a bathroom for houses without a cellar area. Plan your escape route. Find the most efficient way to get everyone out of the house. Allow for alternate routes in case your escape is blocked by fire or fallen debris. Discuss and practice these routes. Pick a safe meeting place outside of the home in case you get separated from each other. Make sure it’s close by and easy for everyone to remember. 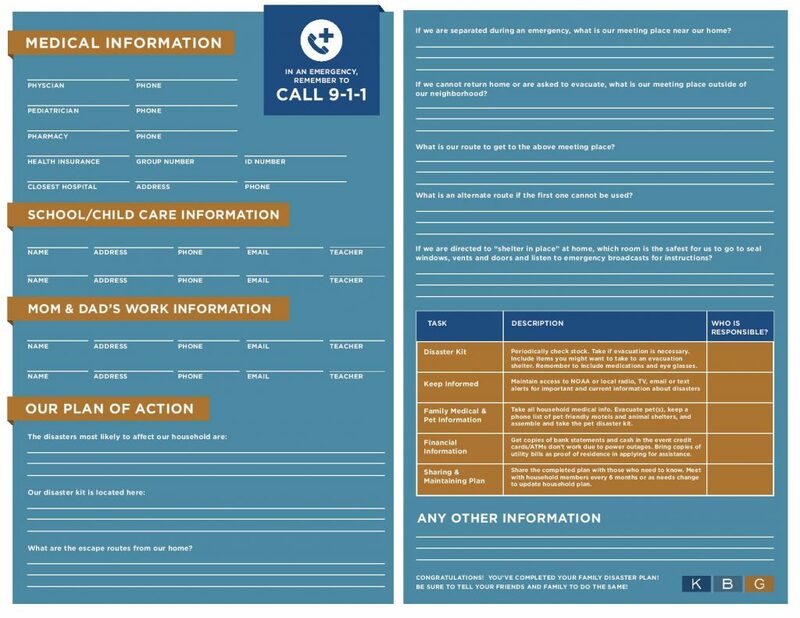 Fill out this family emergency plan template and know where it is at all times. The refrigerator can be a great spot for posting information. An office or bedroom bulletin board will work too, as long as it is always accessible. Your plan should have all pertinent medical information available in the event that you have to be rescued or brought to a hospital. Emergency contact information should include both local and out-of-state contacts in case a regional disaster occurs. Update your information as it changes and check it every six months or so. You don’t want to leave inaccurate or misleading information for emergency responders. Keep blank copies of your family emergency plan checklist in case you need to remake the whole thing. Discuss your pan regularly with children, especially if inclement weather is looming. In addition to posting your emergency preparedness plan on the refrigerator, give copies to family members. You can even put them in glove compartments and school backpacks — just be sure to keep the private information protected in a plastic baggie or something similar. A little preparation can go a long way. You need not be frightened — being prepared should make you feel more confident in the event of any disaster.